I like my popcorn. When Michelle is out for the evening I can quite happily make do with a supper of popcorn with cheesy seasoning. 11 Years ago I was in a Target and spotted the popcorn maker below. It was inexpensive ( under $15) and came with a simple recipe that I’ve tweaked a bit over the years so it’s exactly right for me. I’ve seen a lot of other inexpensive poppers in various stores, all that really matters is that you can stir the popcorn kernels while cooking and that steam can get out. 1/2 cup Orville Redenbacher’s Gourmet Popping Corn – it doesn’t matter what type: his hot air popcorn, White Popcorn, whatever. This is simply the most reliable popping corn I’ve tried – and I’ve tried plenty. It’s not that pricey and we’re talking, what, $2 more for a container of something that will make you at least 10 batches of popcorn? You can’t even buy 1/3 of a small popcorn at a movie theater for that price. 1/3 stick of butter – use real butter not margarine or oil. If you’re on a diet have some celery instead. Put the popcorn popper on the stove, set the burner to just under medium-high (7.5 on my stove dial). Add the cooking oil and 3 kernels and give a couple of spins with the popcorn paddle to spread things out evenly. Turn on your oven, it really doesn’t matter the heat, and set the cooking timer to 2 minutes. This will heat it up and dry out the air in the oven. Put the butter in a small pan on the stove. I like to have it on maximum power for about a minute or so to get things moving and then bring it down to medium-low. When at least two kernels have popped this means the popper temperature is right, dump in the rest of the popcorn and spin the popcorn paddle a couple of times to spread everything out and get the hot oil all over the kernels. You can either spin the popcorn paddle continuously or wait until you hear the first kernel pop. But make sure you keep spinning it after that. Not fast, your goal is to both keep the popped corn from burning and to encourage the kernels to all pop at more or less the same time. When the popping has slowed (less than one pop per second) pull the popper off the heat – better a few unpopped kernels than ANY burning happening in your popper. 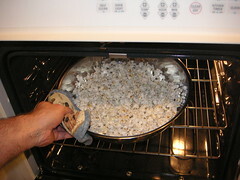 That smokey smell is instantly absorbed by the freshly popped corn and can ruin the batch. Shake the bowl to even out the popcorn and then take the butter from the stove, it should be fully melted by now and start spinning the bowl. Drizzle about one third of the butter over the popcorn, then either shake the bowl or use a spatula to mix it up. Do this a couple more times to get butter all through the popcorn. Plain salt can work fine here. If you go to “Wendy’s” restaurants you can grab a fistful of their salt packets and use them instead, it’s very finely ground and will stick to the popcorn nicely. Like with the butter, make sure you add some salt/seasoning, mix up the popcorn and then add some more. That way you don’t end up with a wonderful top and a bland bottom. Take your popcorn and toss it in the preheated oven for about 10 minutes (prep your movie or check your email). What you want to do is to get rid of as much moisture as you can. Warning: if you are using the seasoning above, do NOT try to put the popcorn into the oven while the burners are still going – the cheese will burn very easily and ruin the popcorn. If all you have is an air popper, the reason its texture is so crappy is because it seems to retain WAY more moisture than when you pop it on the stove (or maybe it absorbs the moisture faster, either way the result is the same). Tossing it into the oven for 1/2 hour (even better if you can shake it up a couple of times while it’s drying) is WELL worth the wait if you can stand it. OK OK I sound a little obsessive here, but I’ve actually experimented a lot and mentally kept track of what worked and what didn’t. The whole thing is pretty automatic for me and, since I’ve already done the thinking, I don’t need to really think about it anymore. Hopefully you can benefit and enjoy your popcorn.